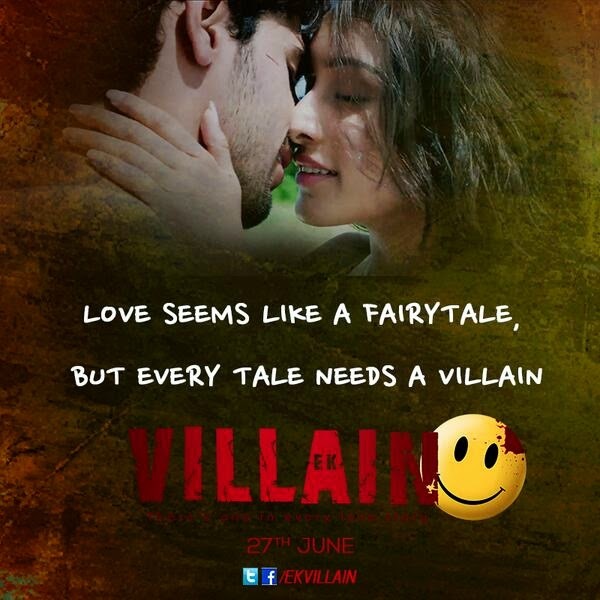 Home / 3 stars / Movie Review / Movie Review--> Ek Villain ~A one time watch! Movie Review--> Ek Villain ~A one time watch! We are told that there is one villain in "Ek Villain" but alas, there are not one but two- two villains running amok here. Guru is our hero or the main villain whose love story we are to witness in the movie. Then there is Aisha who is fatally ill but still so radiant that she can give any healthy person a run for his money. Her skin sparkles, she is forever running from one place to another, helping strangers and ticking off her bucket list. The viewers dont know what has happened to her and then she is cured but still killed by another villain Rakesh (Riteish Deskmukh) leaving Guru crazed with grief and hell bent on revenge. While I loved the music and the beautiful shooting locations, the story left me confused. What is Mohit trying to show exactly? He talks about a villains love story which happens mostly in songs and in flashback but the major portion is just a silly hide and seek with another villain who is killing women all over the city and although both the police and Guru know about him, they are letting him go free just to taunt one another! Just before the interval you start feeling like the director has lost track of what he wants to show in the movie. There is a mental asylum kidnapping that just happens with no repercussions, a disease that is killing the heroine but just gets cured miraculously, a hero who just grunts and even though he has no job experience, gets a job so easily that it is laughable etc. The item song is just pushed in all the chaos already going on. There is no logic here except the desperate need to try anything to get the movie success even if it means adding an unwanted song! Riteish's acting is A-class and a notch above the rest of the cast. He proves that he is a versatile actor who can play any kind of role with finesse. Sidhart Malhotra has also evolved as an actor and he justifies his role of a gangster turned good. Shraddha Kapoor still needs acting lessons but manages to touch our hearts in some scenes like when she tells Guru about her illness. I was very entertained in the first half where I cried and then laughed too along with the love birds but the second half is a drag where the story just goes off track. Its like a cocktails gone wrong. Mohit takes up many issues like the domestic abuse in families, the struggles of middle class families, the problems created when one partner is dominating the other to the extent of trauma and the rehabilitation of gangsters but no clear solution is given in any of them. The trailers showed this movie to be a romantic thriller and left the fans with the notion of an intense love story with a thrilling chase after an elusive criminal but instead we get a criminal found so easily that it is almost laughable and then a play of hide-and-seek that leaves the police's role in question while the ending leaves us questioning the justice system. Is this how the general public is protected? People just walk in, kill and then move on with no fear of any kind of punishment! All in all, I liked the first part, loved the music, enjoyed the beautiful locations but didnt agree with the story and the execution. 3 out of 5 to Ek Villain only because of the songs, acting and locations. It's a one time watch for people who have not seen the original uber fine and madly thrilling Korean film I Saw The Devil, a crackling 2010 horror-thriller.